National Brake and Automotive – Auto repair and brake servies for Edwardsville, Glen Carbon, Moro, and the surrounding areas. 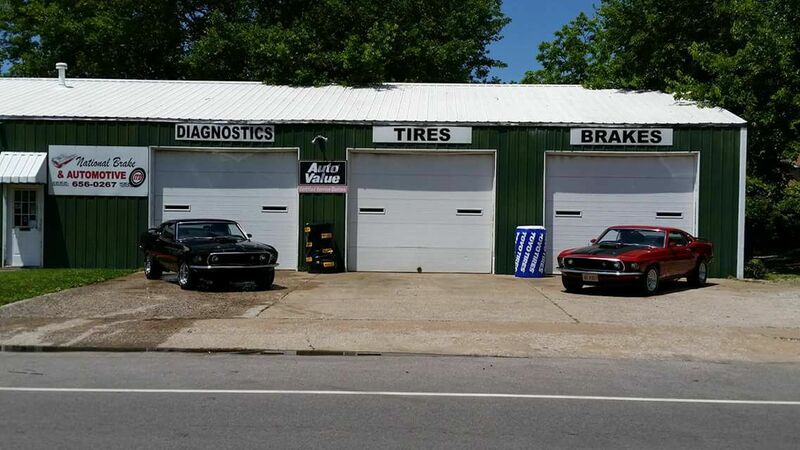 For all your automotive needs, serving Edwardsville and surrounding areas for over 50 years! Looking for an honest quote? Come by today! Been going there for 20+ years. Highly recommend. Wonderful and genuine service. These guys took extremely good care of me and I'd recommend them to absolutely anyone. Lou and his crew took my mom's van from sounding absolutely horrible to sounding like a vehicle shouldn't nice and quiet. We thought for sure she needed fuel injectors (based on what auto zone told her) but were pleasantly surprised to find the real issue costed much less. We also thought she needed an alignment with new tires but we were told that it didn't actually need the alignment. I don't know many (if any) other mechanics that would be honest enough to save you money. My mom and I are very happy with the service she received. I definitely recommend this place. We will be back again. Awesome job getting my ac in my truck fixed. I appreciate it a lot. Blows colder than it did when I bought it. Thank you so much Lou I recommend this place to everyone who needs work done. Great place!!! Great Service!!! Louis and Mark got me going and they do all the little extra things to make you feel confident in your vehicle when you leave!!! They have my business. Ripped a friend mine off. Made the repair. Afterwards told her. The repair would have been covered by dealer warranty. Few days later, oil every where. Towed it to the dealer. Dealer fold. They didnt tighten the lines they replaced. Crank case cover cracked. They refuse to refund her the money for the work they did incorrectly. If you have a choice of them working on your car or you wrecking it, wreck it. The insurance will pay for it. National Brake will only cost you more pain and money. We took our 2010 F150 Truck in for brakes. We have never replaced the brakes since we bought it new. We took it to National Brake and Automotive. They are so honest. They checked them out and said we still had about twenty thousand miles left on our brakes. He didn't charge us a dime for checking them out. They don't only fix brakes, they replace tires and any automotive issues, except transmissions. I believe any other place would have replaced the brakes regardless. We will be taking all our vehicles there from now on. Thank You! I escaped the hurricane by coming to Edwardsville from FL. Due to the car ride, a few things went wrong with the car. Needed a tire sensor changed, my trunk wouldn't open(wasn't a new problem) , and needed an oil change. Was in and out in about an hour with it all fixed and ready to go. Best, friendliest, and most honest shop I've come across.